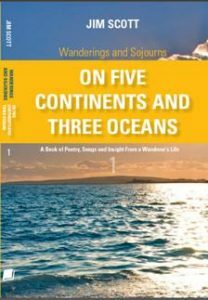 In this, the first of the “Wanderings and Sojourns” series, the reader is taken on a variety of journeys spanning all the continents of the world except Antarctica and Australasia. They’ll travel by sea and land to Caribbean islands and sub-Saharan savannah, South American mountain ranges and rivers of Asia, North African markets and verdant English valleys, all the while living the adventures and experiences that gave rise to the unique philosophies shared within these pages. Interspersed between these true stories are works of lyrical verse; songs as varied as the wanderings and sojourns from which they were born. Themes vary from sharing of wisdom among travelers to respect for one’s rifle during insurgent war, transition of a boy into manhood or the last portage two adventurers will ever share. The world beyond convention is the canvas upon which these unusual stories and songs are painted, the pallet comprises many spectra from shipwreck to war, spirituality to atavism, Aboriginals to ghosts, and the resulting pictures provide a fascinating view of the world as seen through unusual windows by someone who doesn’t quite conform to the norms of society.